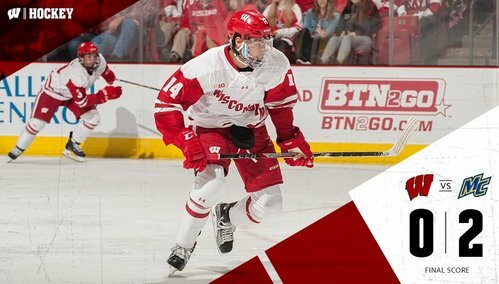 The University of Wisconsin men's hockey team continues its homestand with the second matchup in a two-game series against Merrimack. Kolquist is gonna go with 12:09 to play on a slashing call. Wisconsin gets its fourth power play of the night. Badgers draw a slashing penalty and will have another shot on the power play with 12:09 left in the game. 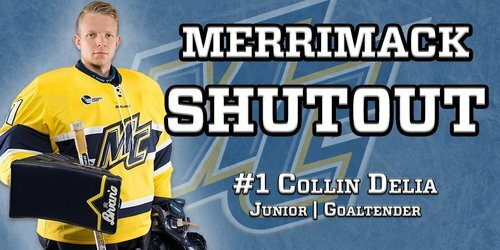 Merrimack's Kolquist gets called for slashing with 12:09 left. Badgers go to the power play (0-for-3). UW comes up empty there. 10 minutes to go and still down by two goals. PK stays perfect and we're at the midpoint of the third. Still 2-0 Warriors. Lackluster penalty from UW and it's 2-0 Warriors with 10 minutes to go. SOG are 7-2 Wisco this period. 27-26 'Mack overall. Both UW shot attempts on that power play were blocked. Both teams credited with 8 blocks tonight. TV timeout with 8:01 to go. Draw will be in the Wisconsin zone. 8:01 left in the third, Merrimack leads Wisconsin 2-0. Delia took a swing at Kunin, who didn't like it too much. Kunin then jarred with several Warriors down the ice. Zimmer-Hughes-Besse now out together for UW. Hughes got a puck wide open in front of the net but couldn't sneak it past Delia. 2-0 Warriors, 17-13 remaining. Hughes collects a turnover in front of the net but shoots right into Delia's stomach. 7:13 left, Merrimack up 2-0. Merrimack continues to block UW's shots. Badgers still pushing here but time is running out. Five minutes left in regulation and Merrimack leads 2-0. Hughes has another great chance in front on a pass from Besse but Delia stops it. Delia is finally whistled for a penalty after taking a swing at Hughes this time. Outstanding save by Delia, and then things got heated. Looks like he'll get a roughing call and someone from the bench will serve it. Merrimack goalie is whistled for roughing and UW will have a big PP opportunity coming up. 4:43 to go in the game. Blancs will serve it. TV timeout with 4:43 left. It'll be a Wisconsin power play after the break with us still leading 2-0. Delia gets a roughing penalty from the crease and UW goes back on the power play. There was maybe a trip on Linhart near the blue line. No call and the fans strongly dissent to it. Kunin another good chance on the Ovechkin-like one timer from the wing, but Delia made a good pad save. Merrimack penalty expires with under three minutes to go. Power play ends. 2-0 Warriors. Just over two minutes left. UW power play ends. Badgers are 0-for-5 tonight. Warriors whistled for elbowing with exactly two minutes to go in the game. Seney will get a penalty now with exactly two minutes left... Timeout Wisconsin. #Badgers now lead in shots 31-29. Outshooting Warriors 12-4 this period. Another power play for Wisconsin. Exactly two minutes remain. UW net is also empty. 6-on-4 for the Badgers. Merrimack's Seney is called for elbowing with 2 minutes left. Badgers go to their sixth power play, and Berry stays on the bench. 6-on-4. Granato pulls goalie to start. 6-on-4 for a full two mins. Big chance for Wagner but he is denied. 1:15 left. Kunin with a good shot from the point and Wagner nearly put home the rebound but an outstanding pad save from Delia keeps it 2-0. Delia two more big saves, one on Kunin's one-timer, then on Wagner's rebound try. 1:15 left. Timeout UW. And now we'll have a Wisconsin timeout. Timeout Badgers. I assume Granato wants to leave top line out there. Shots in the third are 14-4 for UW. For the game, 33-29 for the Badgers. Malone is the extra man with the usual top PP line of Kunin, Hughes, Besse, Wagner, Linhart. 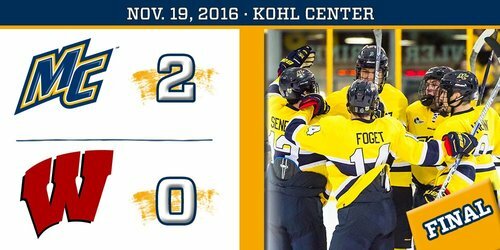 Final: Merrimack 2, Wisconsin 0. Collin Delia makes 33 saves for his second collegiate shutout. The teams split the non-conference series. FINAL: Merrimack 2, Wisconsin 0. #Badgers fail to get the sweep. First road win of the season and first here in Madison helps us improve to 5-6-3 on the year! And of course... THE SHUTOUT! Second career clean sheet for the junior; first in two years (last was 11/28/14 vs. Clarkson). Tony Granato didn't have an injury update on Matt Jurusik after the game. The goalie will see a doctor on Sunday. Granato: "He was probably the one guy that was sharp to start the game, which was what we were looking for tonight." More Granato on Jurusik: "It's disappointing that he's probably going to miss some time now." Jack Berry on Jurusik: "Those situations, they're never really easy to come in. You're kind of thinking about him in the back of your head." UW's Luke Kunin conceded Merrimack did well on forecheck, neutral zone, but "It was our game that didn't show up tonight, and that showed." 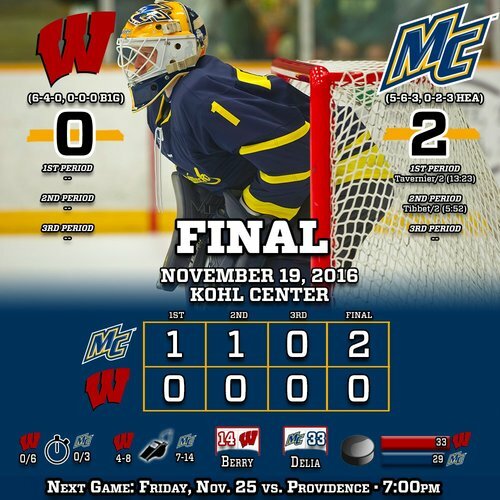 The Badgers could not overcome a first-period deficit tonight, despite outshooting Merrimack 33-29 in the contest.